Today's casual photos, again taken with the Panasonic digital camera, are Kriya Systems, Inc.'s Typing Tutor III (1984) from Simon & Schuster for the Apple Macintosh, and three cartridges for the first ever programmable videogame system (i.e., utilizing interchangeable cartridges), the 1976 Fairchild Video Entertainment System (VES), later known as the Fairchild Channel F after the release of the Atari Video Computer System (VCS) in 1977. In fact, after the name change, Fairchild would come to pull out of the market entirely and Zircon would assume rights to the platform, which limped its way into the bargain bins of the early 1980s. 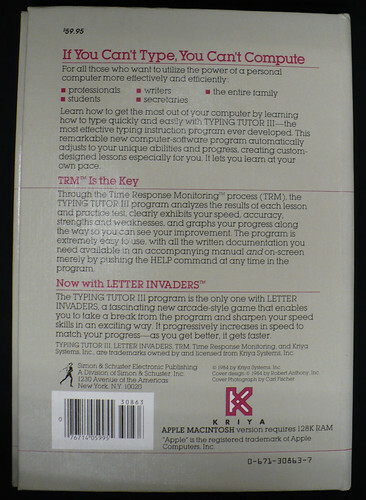 Typing Tutor III was among the earliest releases for the original Apple Macintosh and required just 128K of memory. While the first Macintosh models eschewed numeric keypads at the insistence of Steve Jobs (aka, Mr. Form First), they're nice to type on and I assume this would have made a great platform to learn typing on. At the time, I just had a Commodore 64, which of course had a mediocre keyboard, but a fine collection of learn-to-type software itself. Did anyone actually learn to type with these programs, though? 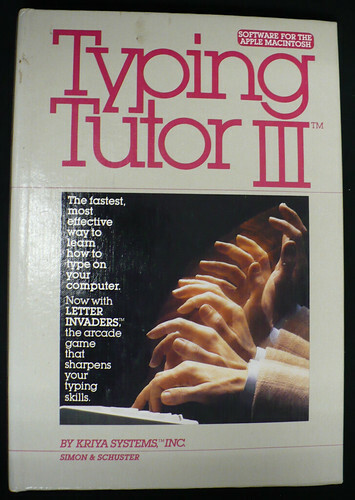 Certainly it was a good reinforcement, but frankly the only way I ultimately learned to become a high speed typist was by taking keyboarding in junior high school (on an electric typewriter naturally) and practice, practice, practice, which my love of computers, getting paid for work, and eventually the Internet made a normal part of my every day existence. Of course, this being a Simon & Schuster published title, it comes in their standard-for-the-time book-like hard cover binding. Nice stuff.